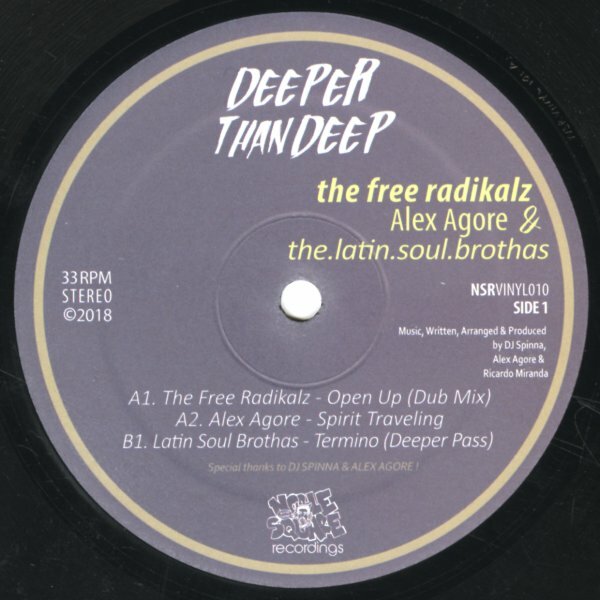 A trio of deeper than deep soulful club grooves from DJ Spinna's Free Radicalz project, Alex Agore and Latin Soul Brothas! Spinna's "Open Up (Dub)" soars with cosmic key atmosphere, nicely layered bits of vocal and a nice bass rhythm. Alex Agore's "Spirit Traveling" pairs nicely on the A-Side, this tune with more persistent beat with subtler trippy keys. The Latin Soul Brothas jam "Termino (Deeper Pass)" indeed imbues a bit of classic 70s Latin Soul inspired rhythms and keys into their timeless house mode. © 1996-2019, Dusty Groove, Inc.